Tomato worms? Are there organic garden pest control methods? Your tomato plants have been growing well. Then one day you notice that a lot of foliage has disappeared. 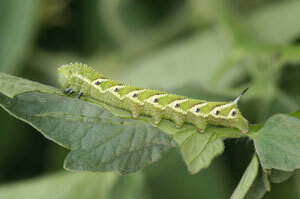 You may have hornworms in your garden! The hornworms blend in very well with the green tomato foliage and usually go unnoticed until the damage is done or they get too large to easily hide. Damage usually begins in midsummer and continues throughout the remainder of the growing season. Tomato worms--hornworms--are large, pale green caterpillars with white and black markings that reach 3 to 4 inches long	when mature. The name "hornworm" comes from the spike on one of the caterpillar's last abdominal segments. 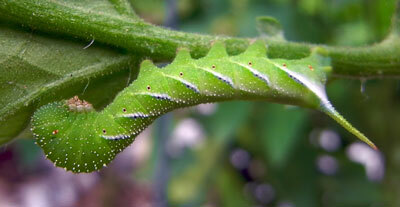 There are two types of hornworms that both feast on tomatoes--the tobacco hornworm and the tomato hornworm. The easiest way to tell the difference between these two tomato worms is by examining the adult caterpillar's stripes. Unfortunately there are also many other types of tomato worms and bugs that can infest tomato gardens. The tomato hornworm has eight angled stripes that point toward its head. The "horn" is typically black. In late spring, the adult moth lays eggs on the undersides of tomato leaves. The eggs hatch in 6 to 8 days, and the larva pass through 5 or 6 stages, reaching full growth in 3 to 4 weeks. The full-grown larva then burrows into the soil and transforms into the pupal stage. The pupa may remain in the soil all winter, with the adult moth emerging the following spring. Or, if the weather conditions are suitable, the moth may emerge in 2 to 4 weeks. The emerging moth makes its way to the soil surface and mates. The female then deposits eggs on the tomato plants for the next brood. The adult tomato hornworm is called a sphinx moth or hawk moth. It has a mottled gray-brown color with yellow spots on the sides of the abdomen. Its wing spread is 4 to 5 inches. 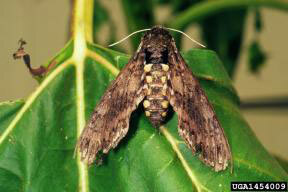 It is a medium to large heavy-bodied moth, with narrow front wings. The spindle-shaped body is tapered at both ends, and the antennae are fairly thick. Tobacco hornworm moths have 6 orange spots on each side of the abdomen, whereas tomato hornworms have 5 similar, but less distinct, spots on each side. Wavy lines on the hind wings of the tomato hornworm are more distinct and jagged than the lines on the hind wings of the tobacco hornworm moth. 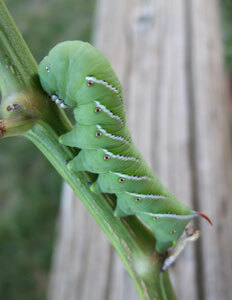 The tobacco hornworm is actually more common in gardens than the tomato hornworm. That's because its range is from southern Canada to Argentina. In contrast, the range of the tomato hornworm extends only from southern Canada to the southern U.S. The tobacco hornworm can be distinguished from the tomato hornworm by its seven diagonal white stripes and its "horn" is usually red. 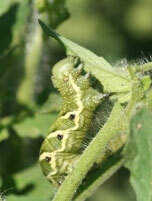 Some plant hosts of the tobacco hornworm include tobacco, tomato, eggplant, pepper, and some weedy plants. The tobacco and tomato hornworm caterpillars feed on the leaves and new stems of the tomato plant. They strip tomato leaves from the vines. 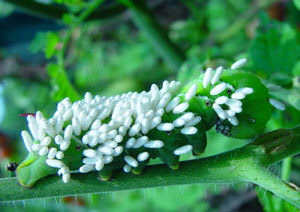 If a heavy population of hornworms develops, they will also feed on the tomato fruit. Rather than boring into the fruit, they feed from the outside of the fruit and leave open scars. However, defoliation is much more common than fruit damage. There are a number of natural factors that help to control the hornworm. One of the most common parasites in home gardens is the small braconid wasp. If you see hornworms with a number of white projections protruding from their bodies, these are the cocoons of the wasps. You should leave these affected tomato worms in the garden so the emerging wasps can parasitize other hornworms. The wasp larvae feed inside the caterpillar and kill the host upon emergence during mid- to late-summer. Hand picking the hornworms off of infested plants in the garden is an effective control method, and is the recommended method for small gardens. Drop them in a can of soapy water to kill them. For chemical control of tomato worms I suggest you contact your county agricultural extension office and ask about organic garden pest control.